NZDUSD : Possible Reversal Higher? 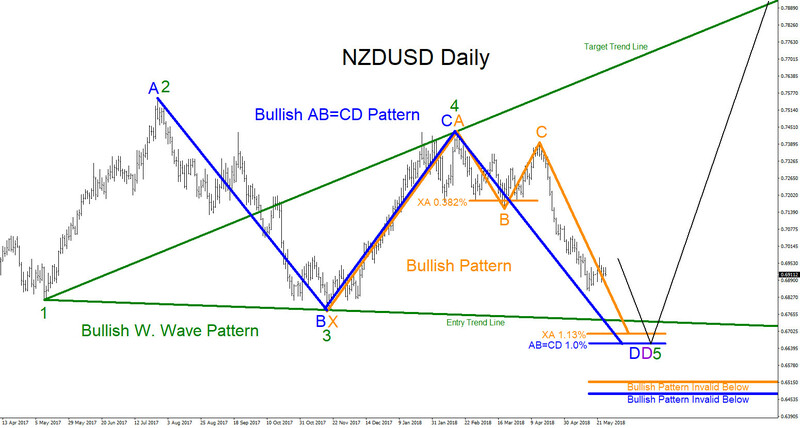 You are here: Home / Aidans Corner / NZDUSD : Possible Reversal Higher? NZDUSD at the current moment looks to be in a 3 swing move lower (Daily chart) starting from the July 27/2017 highs. Expect price to continue lower and break below the November 17/2017 lows. If breaks lower, the next level of interest where NZDUSD can find support and possibly reverse and bounce higher can be seen at the 0.6690 – 0.6470 area. There are two clear bullish patterns that can possibly trigger BUYS in this area. In the Daily chart below first orange bullish pattern triggers BUYS at the XA 1.13% Fib.retracement level (0.6694) where the pair can find bulls waiting. Second blue bullish AB=CD pattern triggers BUYS at the 1.0% Fib. Extension level (0.6658) where the pair too can find bulls and push price higher. Orange bullish pattern is invalid if price moves below 0.6515 and the blue AB=CD bullish pattern invalidates if price moves below 0.6470. As long as price stays above these invalidation levels it is possible that NZDUSD will reverse higher.